San Ford Machinery Co., Ltd. was established in 1963 and has been involved in anti-pollution system for over 40 years. During these years, we have expanded our capacity and developed a series of products. 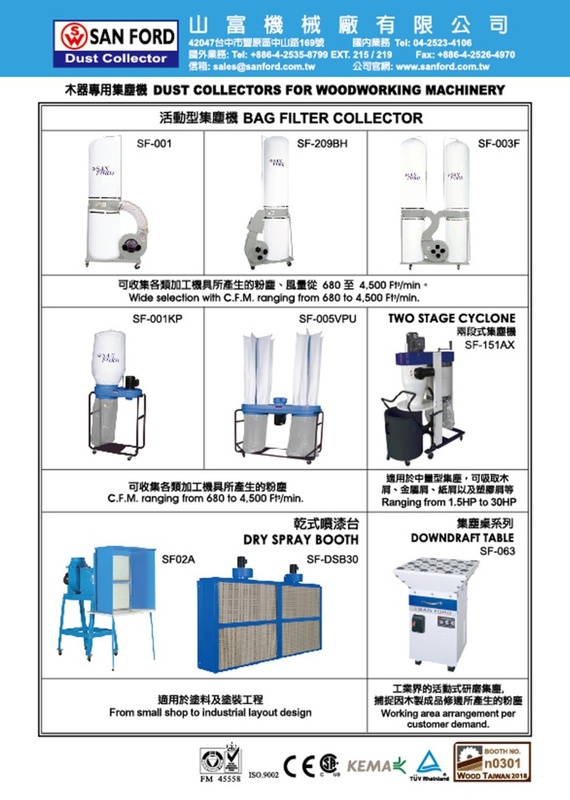 These products include bag filter dust collecting system, portable dust collector, sanding dust collecting table, air cleaner, spray booth and whole plant equipment of sanding dust heat compression machinery, steam heating type lumber drying chamber and air/water cooling & drying unit. We have had over 35 years of export business experience and our customer line is diverse and extends to all corners of the world including the USA, Mexico, Canada, France, Germany, UK, Spain, Italy, Czech Republic, Latvia, Russia, Africa, Korea, Japan, Taiwan, China and East South of Asia and Australia etc. We have built the excellent reputation by good design and the best quality. All our products are approved by CSA and CE to ensure the best quality. The customers choose us not only for the reason we would meet their criterion, but also, our products are easy to operate, maintain and depend on due to the simplicity of design, quality and consistency. Contact us now for the superior quality products at competitive prices.